Photo courtesy of Mark James / Memphis Wrestling History - Sputnik Monroe integrated pro wrestling in Memphis at the height of segregation. Sputnik Monroe understood the purchasing power of black people and transformed Memphis’ pro wrestling fanbase at the height of segregation. In the early 1970s, the white pro wrestler Sputnik Monroe worked as one-half of a tag team with the black wrestler Norvell Austin. The duo played on the racism of Memphis’ white fans, with Monroe proclaiming that “black is beautiful” and Austin responding that “white is beautiful.” Austin had dyed a silver streak in his hair to match the one in Monroe’s, and the pair often implied that he was Monroe’s son. In return, fans lobbed racial epithets. According to wrestling historians Greg Oliver and Steven Johnson, he earned his “Sputnik” moniker while working in Mississippi in the mid-1950s. He’d shown up to a television taping in the town of Greenwood with a black hitchhiker in tow, provoking a white woman who was a regular at the tapings. Monroe noticed that the interaction was getting a crowd reaction and so he continued to make small talk with the man until the woman called him “a goddamned Sputnik,” referencing the recently launched Soviet satellite that had terrified many Americans. Like most wrestlers, Monroe thrived on angry audience reactions, but unlike a lot of his peers, his act took on a surprisingly progressive cast. When he arrived in Memphis in 1958, the city was in the midst of an artistic renaissance but still deeply segregated and riven by racism. The local label Sun Records had started raking in money after owner Sam Phillips signed Elvis Presley, a young performer who was an answer to the producer’s prayers: Although white, he danced and sang in a style borrowed from the black artists already on the label. Sputnik Monroe didn’t have a master plan like Phillips, but he was about to do something similar — an early commodification of black culture and fans that has, in the decades since, become somewhat of a staple in entertainment. Eager to maximize his bottom line, he understood the ticket-buying power of Memphis’ black community, which constituted around 40 percent of the city’s 500,000 or so residents. At the time, they were forced into a segregated section in the back of the 12,000-seat Ellis Auditorium that was too small to accommodate everyone who wanted to attend. And so Monroe directed his cocky, catchphrase-spouting persona toward them, demanding that his employers allow black fans to buy general-admission tickets. His clout at the box office was so considerable that the demand was granted. Today, marketing to underrepresented consumers is a fairly common business strategy; groups as diverse as “wealthy blacks” and the “gay and lesbian community” have been identified as potential money-makers. But in Monroe’s day, the significance was deeper than money. “I did it just for the hell of it,” Monroe himself told interviewers, aware that he was about as unlikely a hero of the civil rights movement as anyone could imagine. But according to his family and peers, the 50-year career spent wrestling in carnivals, fairs, auditoriums, and arenas wasn't just about drawing money. He left high school at 17 to join the Navy, and when he returned from the service in 1947, he began touring with a carnival. 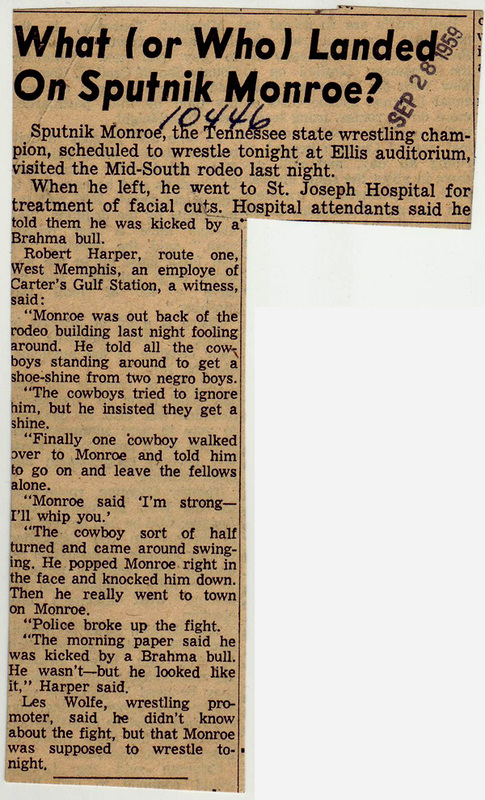 On the road, he’d wrestle any and all challengers, usually local tough guys who would bet a dollar to win five dollars if they could subdue Monroe. Monroe’s task was to defeat such a person by any means, and he usually did. Monroe arrived in Memphis after seven years of touring backwater towns throughout the American South and West. At the time, the local wrestling promotion, which was operated by Nick Gulas and Roy Welch, was suffering a significant decline in business. All of Memphis’ other public facilities, from bathrooms to lunch counters, were segregated. Altering even one aspect of how the city’s black population was accommodated, in this case at wrestling shows, could have an immediate impact on ticket sales. Promoters Gulas and Welch put Monroe in a months-long feud with Billy Wicks), a tough, athletic wrestler who had a strong background in both amateur wrestling and the sort of carnival grappling Monroe had done. Wicks had been built up as a blue-collar hero to Memphis’ white fans — he even volunteered with local law enforcement during his off time — and Monroe, a menacing brawler, was expected to play the foil in the dozens of weekly matches, leading up to a “blow-off” bout that would determine a winner. He ate and drank with black fans, partied with them, gave them discounted coupons for access to his matches, and thus cultivated an enormous following in preparation for his main event showdowns with Billy Wicks. Monroe frequently left the area to work programs in other parts of the country. One of his most memorable feuds outside the South took place in 1964 and cast him as a trash-talking villain against “Thunderbolt” Patterson, a black wrestler who boasted a large fan following in Detroit. In the ’70s, not long after his interracial tag team stint with Austin, Monroe’s fortunes gradually declined. He remained a featured and extremely popular guest on wrestling cards throughout the Southeast, but he had divorced his wife and his finances took a turn for the worse. Monroe’s story ended with his death in 2006, but it continues to flash to the fore from time to time. There has been talk of a miniseries, of biopics — all to no avail, even with The Wild and Wonderful Whites of West Virginia director Julien Nitzberg attached to the project. In 2016, alt-country singer Otis Gibbs released a song about Monroe that does a fine job of recapping his life and times. And Monroe figures into the background of books about Memphis and can be seen in historical displays around the city. Sputnik Monroe was inducted into the Pro Wrestling Hall of Fame on May 20, 2017. Oliver Lee Bateman is a historian and journalist who lives in Pittsburgh. Archival images courtesy of Mark James and Memphis Wrestling History.